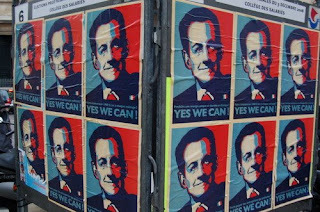 First it was the former Israeli Prime Minister, Benjamin Netanyahu designing his Web-site for re-election, in the same format as Barack Obama's campaign Web-site, now you have the French President Nicolas Sarkozy using the same slogan, "Yes we can" How weird!! I really love the blog Linda. I can definitely click on here and keep up to date with what's happening. I was not able to see the piece on NBC in Belize so I really appreciate you having it available for others. you should give a link to netanyahu's site so we can see it for ourselves. Linda, I did see the Today Show in Belize I think it is wonderful that our beautiful country (Belize) is out there for the world to see, It will be good for tourisim as long as they keep it clean (enviormentaly). Keep up the good work Linda, we are very proud of you. The design format you're referring to is actually done by a popular street artist, who is also designer for the streetwear line OBEY. interesting.